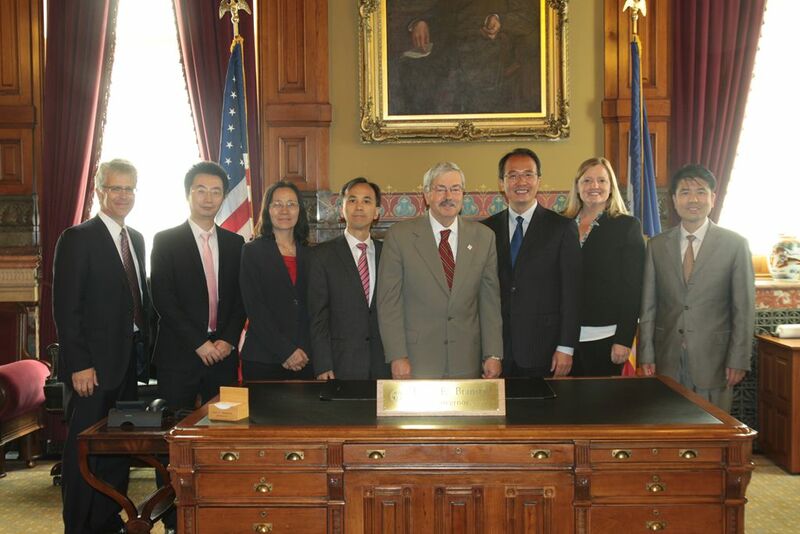 On September 21, Consul General Hong Lei visited the State of Iowa and met with Governor Branstad in Des Moines, the State Capital. Consul General Hong Lei said that Governor Branstad is an old friend of the Chinese people and one of the governors of the Midwestern states who visit China most frequently. With Governor Branstad’s care and support, relations between China and Iowa have enjoyed sound development in areas like trade and investment cooperation as well as closer exchanges in culture, education and scientific technologies. Currently, the Chinese economy continues to grow rapidly. China-US sub-national cooperation has great potential and broad prospects. The Chinese side hopes to make joint efforts with the State of Iowa to made new progress for our friendship and cooperation. Governor Branstad happily recalled President Xi Jinping’s two visits to Iowa and his many visits to China. He said that Iowa cherishes the friendship with China and the Chinese people. The two sides have established a good partnership and conducted mutually beneficial and win-win cooperation on the basis of mutual respect and trust. The State of Iowa looks forward to carrying out more extensive and pragmatic cooperation with China so as to better benefit the two peoples.